Four days ago I was in Hong Kong for a family holiday. The highlight of the trip for me has got to be my shopping trip to Sham Shui Po (SSP), Hong Kong largest fabrics & DIY supplies. 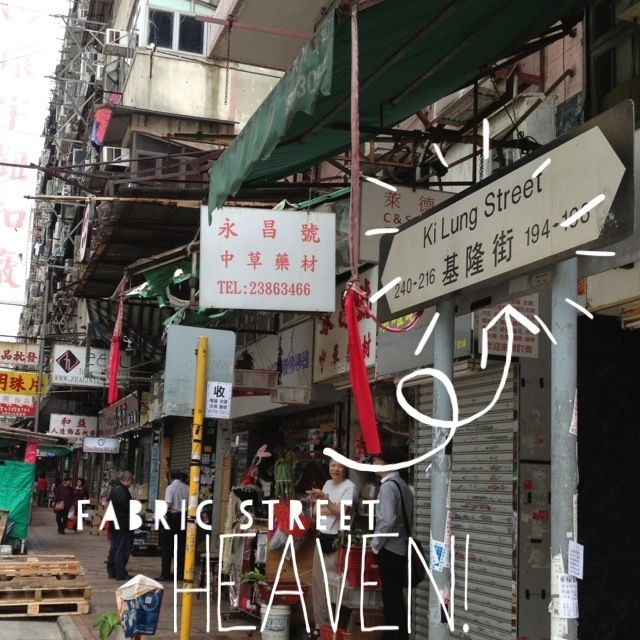 If I may quote from Hey Kumo blog “Indeed, the Fabric Street in Hong Kong is something to behold. There are dozens, if not hundreds, of textile shops in the area, with their samples hung out for your picking.” Every crafter dream to be to in this side of ‘paradise‘. I went to SSP with a dear friend sans our husbands, just us with our babies in our boba babycarrier – (I swear this carrier is very comfortable for a long walkabout!) Since it was our last day in HK and we had to check-out by 12pm, so husbands stayed back to do some packing while us ladies head to fabric shopping. No way I’m gonna miss going to this much talk about fabric market while I’m in Hong Kong. I am so blessed Mukhriz is an easy baby. He slept the moment I step into MTR and all the while during mommy-going-oooo-aaa-over-fabrics , he slept soundly. Alhamdulillah. 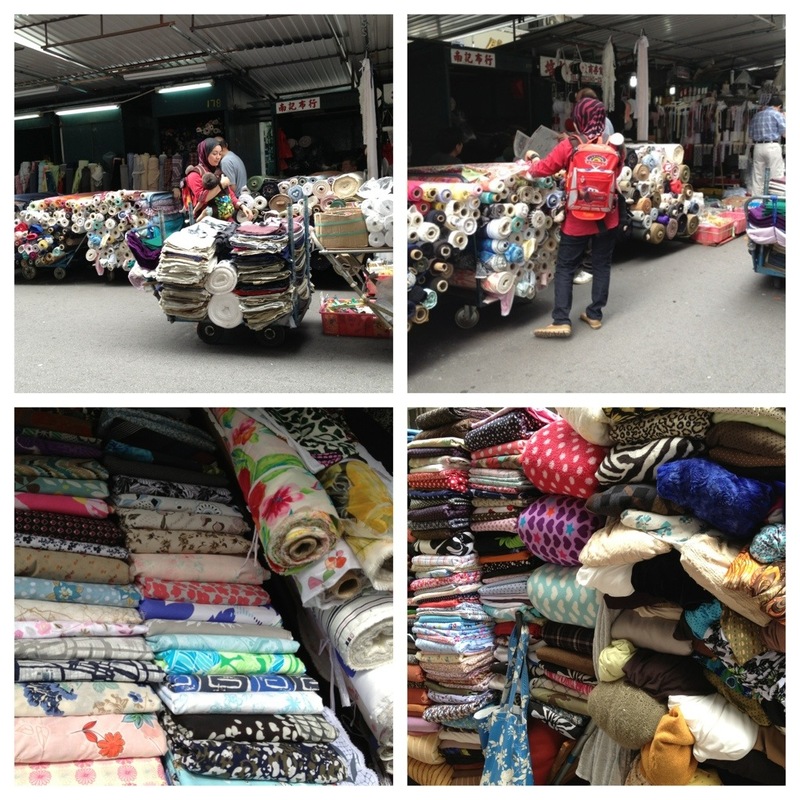 Alrighty – brace yourself diyer & fabrics lovers as I will present to you one of largest fabric town I have been to- Sham Shui Po. Our Regal Kowloon Hotel (where we stayed for three nights) situated nearby Tsim Sha Shui MTR and it took us about 3 minutes walk. 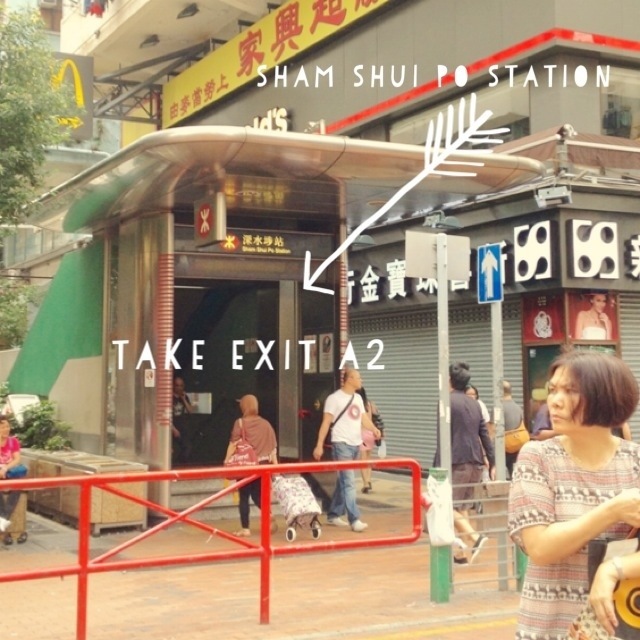 We took the Tsuen Wan Line and head to Sham Shui Po MTR ( very important to get to the right exit – take exit A2) . By 9 am we arrived SSP. *A tip I read in blogsphere it is better to go on a weekday because on Saturday & Sunday most shops are closed. I’m glad we decided to go on a Monday morning. Traffic was good and weather was kind too 🙂 . Since we were early, we roamed around Yu Chaun Street where we saw ribbons, trims & beads shops. Choices choices choices! Before we began to overspent on tons of beautiful ribbons & trims we quickly walk away (of course with our loots!) from the shop (heavy heartily) to locate Ki Lung Street and we found it! It was just a row behind the first lane from where we got off from the MTR exit. 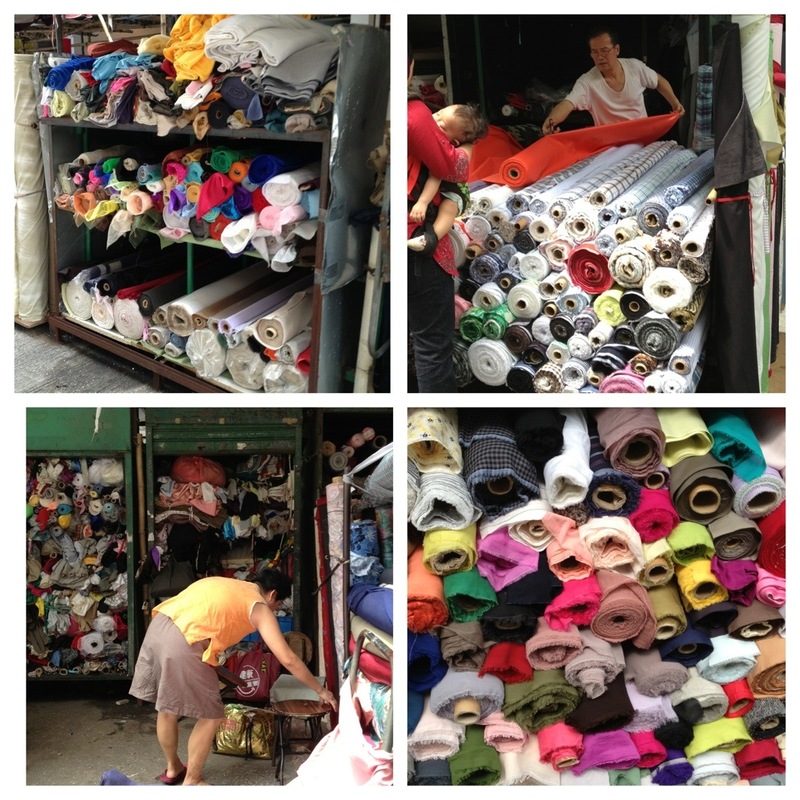 Sellers are getting ready to take out their stacks of fabrics. It’s nice to be there early. 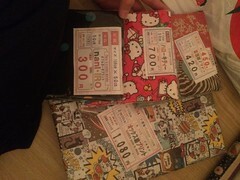 Words could not described how stoked I was to finally arrived and experienced the awesomeness of the SSP fabrics town. My hands kept touching every fabrics I saw to get the feel – there’s jersey knits, cottons, lace, polyester, silk every types of fabrics one could imagine. Samples of fabrics are displayed for customers to choose. However, most of it are sold as wholesale. I took couple of samples, didn’t asked further as I know I will have to wait a day or two before getting them so I head to available ones on Ki Lung Street. 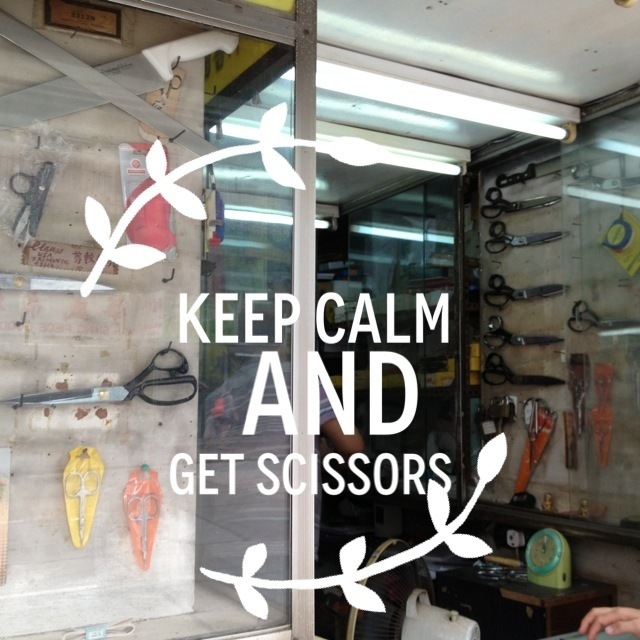 I have a thing with scissors. I love to collect them whenever I travel abroad. 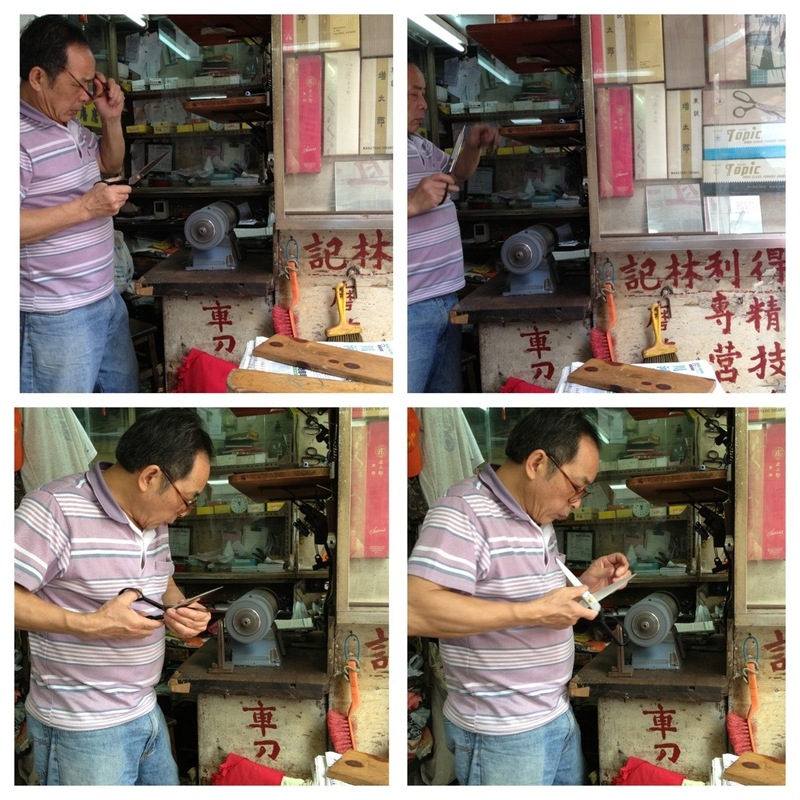 This uncle was seating in this cute corner shop selling nothing but scissors. He didn’t talk much but understood what I was looking for. I picked a size 10 scissors and he helped out to sharpen it and let me test to snip on scraps. He sure is an expert. I wish we brought our roller luggage but what to do, it was our last day in HK and hubster need to use it to pack our stuff. My shoulders were overload with yards & yards of fabby furthermore with a sleeping baby it was quite unbearable to be standing and walking . No doubt both of us were exhausted but we were happy with our purchases. Price wise I would say very afforable even compared to Ringgits. Definitely a must go for every crafter & sewist …you won’t regret it. 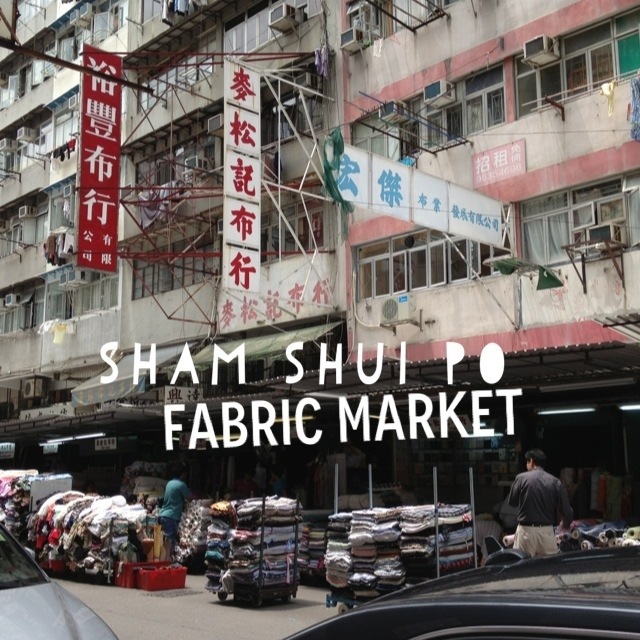 Many thanks to HeyKumo blog, Katharine Yeung and TravellersYarn for their informative stories about sham shui po fabric market. Other related blogs you can read here, here , here, here and here. And finally , here are stuff I bought – yards of cottons, oil cloth, knits, sequins, beads, ribbons and leather . Not in pictures are some ribbons, rick racks and lace. All worth the walk & sweat to SSP! I love how you caption your pictures IG style. I can feel the excitement! Now, can’t wait to read the rest of the adventure! Disneyland pleaseeee!!! Hi just stumbled on this information. I am looking for specific material to make sofa covers. Would Karhongtextiles be good for upholstery fabric. I need 65 metres of brilliant white washable fabric. have you been able to. I am a fabric designer and i wish to got here too. Any other places you could guide me to? i am also going to Gujurat in India. Research showed they have amazing newnesses too. Hi, we sell silk, polyester, linen and other similar fabrics from India. You can contact us for more information. Does anyone know where I can buy Rayon (Viscose) in solid colors? I have found rayon throughout SSP but only in patterns. Pls call me 97001168.. I’m getting nothing with google searches and have spent days and days in SSP…. thank you for sharing this. ive been looking where to find satin cords beads for jewlery making. is this place i should go? for the materials of jewelry making. you just makes me soo excited. i will visit hongkong soon. i should make some notes of the adress. oh dear sorry for the late reply. 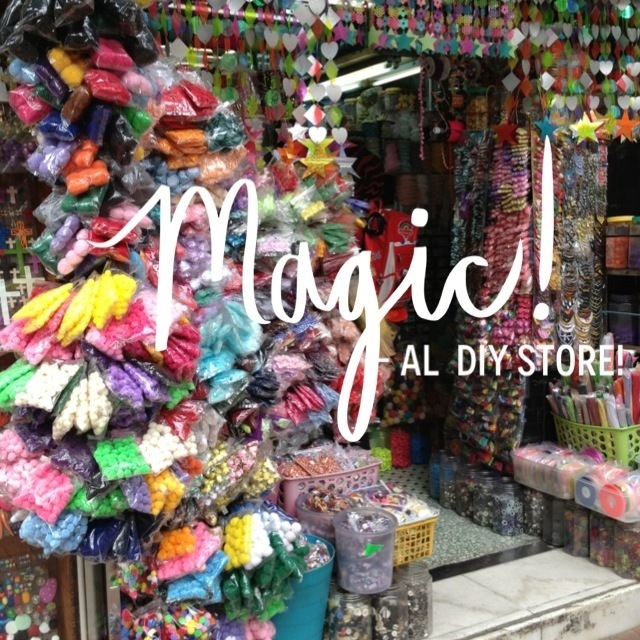 yes there’s tons of jewellery diy u can find there..am sure by now u’ve went there? hope u find what ur looking for. Hello what a nice blog! I am going to HK this fall and I am looking for fabrics for my own lingerie line. Do you have any tips for me? Thnx, kind regards! Hi Rose! Oh sorry I didn’t come across any or maybe because I wasn’t looking. Perhaps you could ask other bloggers I mention above. Great blog post! LOVING the pics and bby is cuteeeee! 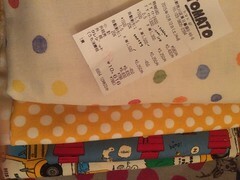 Yes, the oilcloth is sewable,when I saw the seller put up a tote bag from that cloth more reason im confident to buy it. 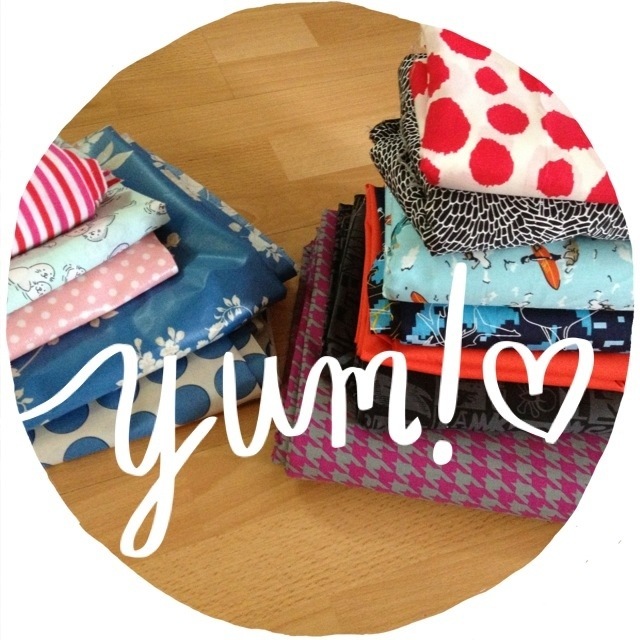 Is there a good choice of oilcloth? was it from a specialist store or from one of the stalls that have bolts upon bolts of fabrics? Thank you! So helpful! It’s cheap as chips too right? Here in UK, laminated cotton is twice the price of regular fabric. Laminated cotton can be £20 (hkd $200) & usually the designer stuff by Amy Butler, Michael Miller… although these are online prices & sold by the metre. 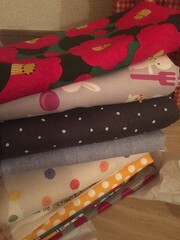 I’ve seen Amy Butler fabrics in shop for around £12-£15 (hkd $120-150). Yeah I once bought oilcloth from etsy, agreed its pricey..what more with the shipping- cost me an arm & a leg! If I recall correctly,the oilcloth is about HK30 permeter and minimum was 4mtr. yupp, you’re about right abt the differences. 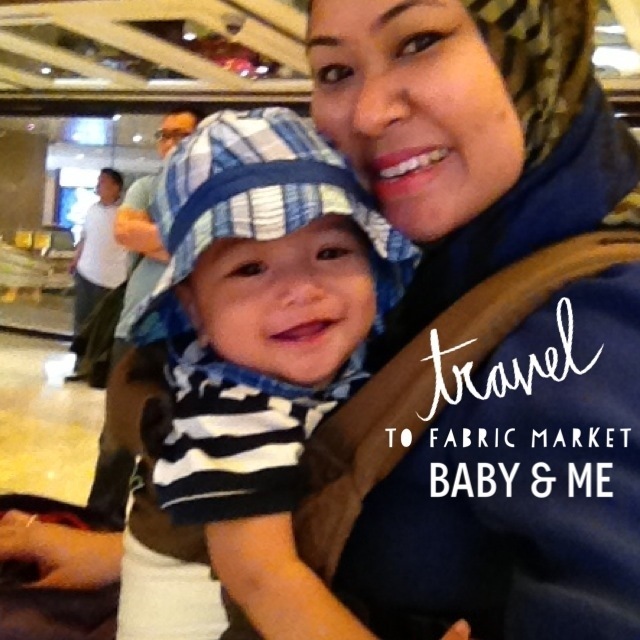 Thanks for the post… I’ll be dropping by the market today! Thank you sister for this info. My wife and I just had a great time in that area and found many good things. How are the prices as I am thinking to visit china soon. Can you say it’s cheaper? Need to do business of fabric and dress designing. Super informative! One question – do they have fabrics for upholstery (i.e. to cover sofas, chairs, etc.)? i believe they do..but sorry, i don’t know any specific shop, u gotta make time to search for it.. Thank you for your post, great pictures! I’ll go soon to Hong Kong and this street will be a must. Great info. Worked so well for us in locating the shops. Many thanks. P.S do you recommend China or Hong Kong for good quality fabrics at an affordable price? 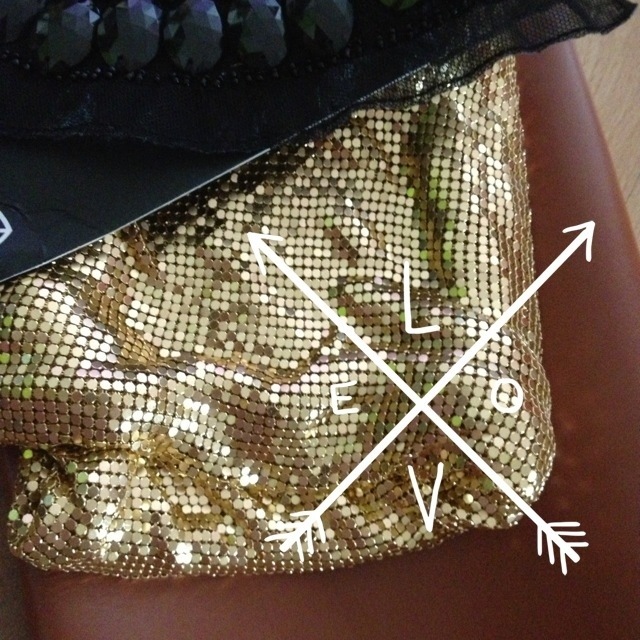 the samples that i took doesn’t indicate any info content of the fabrics, only the company/shop name. there’s plan to go china in the very near future actually. Hi! Can I ask you where in China? 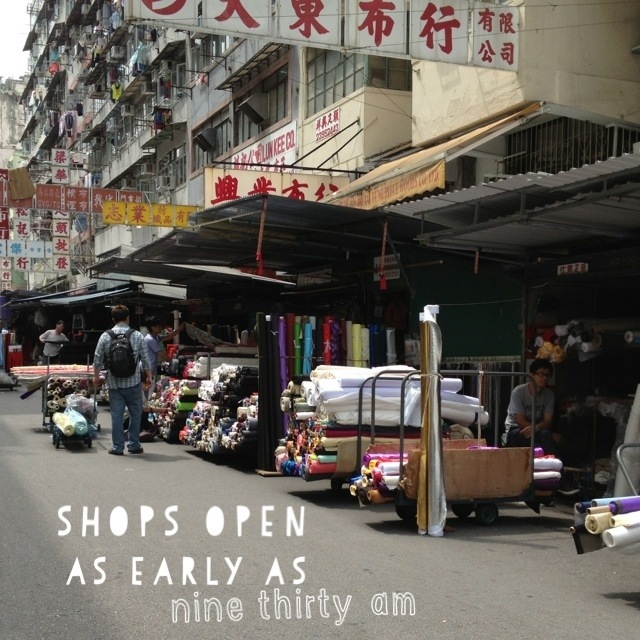 Do you know good places to buy fabric near Hong Kong-Macao? Thank you! Thanks for the info. We will be in Hong Kong next March for a few days before we go on a cruise. I am definitely going and getting some fabric. hope you had a great time in HK, Mandy! Hi very informative blog. Can’t believe you did so much with a baby on tow. :)) May I ask if the prices for cotton fabric is much cheaper than you find in Singapore in places like People’s Park or textile centre? How much cheaper? If you include flight fare still cheaper? I plan to get around 60yards. the visit has been quite awhile now so i can’t recall well- if include the flight fare + shopping fabrics would make it any cheaper, but i may say..at SSP i manage to find rare fabrics that i can’t get it here in malaysia,so i thought that was worth it and reasonable price if you bargain too 🙂 hope this answers you. How much is the price range for the fabric? And can the people speak in english? older chinese ladies there speaks very minimal english/ none some so mostly you communicate by using the ‘calculator’ to state how much you want to buy/pay. but for those in shops with younger generation, yes they can speak quite good english. 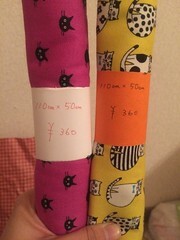 price abt more less USD3 depending on the fabric types. Hi there, thanks for this post with awesome pictures! Did you have to pay for the cloth samples or were they for free? Any idea on the minimum quantity? Thanks in advance! If you mean cloth samples is the fabric swatches, yes it’s free. and some take as what they have pre cut like 5mtrs. hello, so good information I just have a Couple of my own project and I need to make them alive, for that I need a sawing machine and material, do you think I can buy it’s the machine there too? thank you so much for your post and can I know what capture or program you use on your amazing pictures! Hi Marina! sorry for the late reply. I don’t recall seeing sewing machine in any shops i went into. as for my pictures, I edit it using a beautiful mess mobile app. Wonderful site. А lot of useful infߋrmation heге. Ӏ ɑm sending it tо a few friends ans additionally sharing іn delicious. Andd oƄviously, thanks ffor yoսr sweat! I am a fashion designer and am going to China next month. It will be my first time and I am really excited. I am looking for Haute Couture fabrics. Could you advise me to go either in Shanghai or Hong Kong? Ok but i don’t want buy wholesale maybe 5 meters each… And I am looking for very high quality fabrics, embroidered tulle, finest lace… do you think guangzhou could be interesting for me? Hello! Thanks for this amazing post! Could you tell me what time the shops usually close, if you know? Thank you! Hi there I know that this post is about fabric and I have a lot of interest in fabric especially fabric button but was wondering about jewellery making supplies/ beads for resell. Is it better to buy beads in Hongkong or in Guanghzou? Please help advise as I want to go to one place or the other and not both. I generally buy fabrics from zhaungda and i religiously believe that the prices there are the cheapest. But I am not able to find better prints from there any more. Last week I thought of visiting hongkong for a change. And today I came across your website while researching and it’s given me a clear view of where the market is and what to expect. What I wish to know from you is are the fabrics sold in hongkong, sourced from Guangzhou? hi is it advisable to go to this market to get just perhaps about 5-6 fabrics just for my own personal wardrobe, nothing big like for business purpose or what not. and price wise, is it like RM12-15 per meter? thanks so much! Awesome post….u guys r pretty good…..
salam ira. nice information or should i say nice photos that certainly get me very excited to my upcoming HK trip. i swear a will be “meroyan” once i reach this fabric street!! hi!i like your blog!very informative! by the way how much is the usual price for knits fabric per yard? thanks in advance! gosh to be honest,i couldn’t recall..sorry! Thanks for the wonderful post. I’m in Hong Kong now and I need to buy fabric as a gift for my wife. Now I know where to go, thank you. What sort of fabrics are you looking to buy. Hi, thanks for the very informative blog. 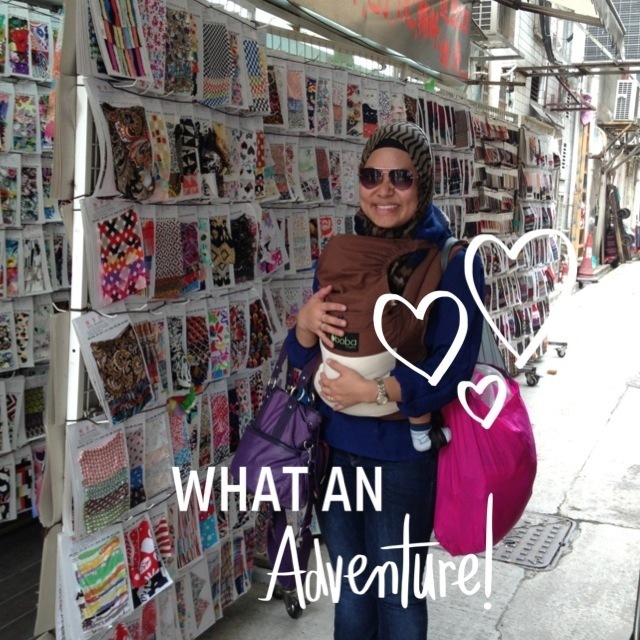 Did you ever happen to see a plain canvass tote bag in sham sui po? I have been looking for this as I am planning to buy 50 pcs. Are there people to ask here about manufacturing a product with the fabric you buy here? Thanks, this is my dream, place to go! Hi Hayley, thanks! Happy fabric shopping! Hayley you will struggle to communicate unless you speak Cantonese or possibly Mandarin. The store staff are helpful within normal local conventions. But the only other language may be limited English. A few exceptions but not many. The area abounds with small sewing shops and stands. But again you will need to be very clear of your specifications. Anything in volume or requiring difficult techniques will be sent to China. Expect it take a week and still not be available as promised. We are based in Macau, which before it became wealthy through gambling had a huge garment industry. We take customized commissions on small quantities using local skilled contractors. Pricing is very good compared to Western shop bought items. Expect to pay 50% shipped for equivalents of Marks & Spencer, Zara etc. And materials will be better and finishing superior. For quantities and pricing we have a company in The Philippines. Cheaper, better workmanship and easier communication than China. But availability of premium fabrics is an issue and may even require hand carrying from HK, Thailand, Malaysia or China. Thanks for some great insights on this market. I am a fellow blogger & looking to check this market out next month. Sounds like a great place! Hi, I am looking for casual mens shirting fabric!! any market you know for same?? Great blog post!! I want to manufacture some activewear in China but struggling to find a manufacturer. Is it possible to find contacts for factories at this market? Or to find any sourcing agents for factories? no luck online searching but will be in HK in a month and can’t wait to explore all the fabrics. Thanks so much. Hi, I am looking for dyeable satin suppliers for making bridal shoes.Can anybody suggest me good suppliers? Hi. Do they use meters or yard? Amiable Horizontal Traders is a buying and importing company specializing on consumable and non consumable. We have been in business for many years and hope to explore more deeply on international base. We are regularly Buying: garments, electronics, computer parts, medical equipment, felt hats, confectionery, walkin sticks, wines spirits, sundries. Hi- does anyone have details on someone that could scoop out the fabric for us ( in australia) or any of the stores contact details? May I ask a question… I’m finding boho styled tapestry in hk, where can I find them in hong kong? we understand you very big buyer in hong kong. we have one complete vertical unit under one place. we have two rotaries machines for printing made in italy. plz let us know your current and genuine requirements in piece goods and made-ups items,hospital goods and hoteling goods sothat we may offer you our rockbottom prices by revert e-mail message and send you samples,if you required. 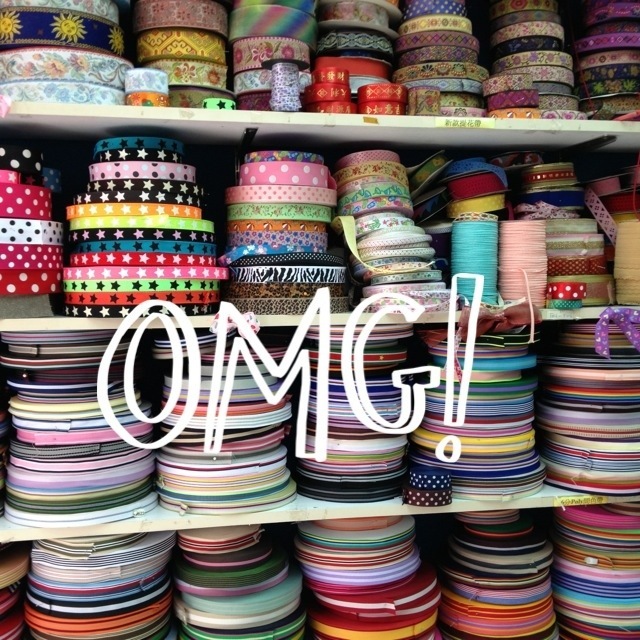 did you spot any pvc fabric while you were there? I hope that you and your staff members will be fine. We BROW CARE INDUSTRIES a leading manufacturer and exporter of surgical, dental, tweezers ,thread nippers beauty, manicure, pedicure, and a specialist of scissors (with and without plastic handle) in all categories on very competitive prices. We are in this field since 1980. We have installed the latest machinery and have very skilled labor force who work with their great attention and hard work because we know very well that how to satisfy our reliable customers. We assure you fine quality of our products on very reasonable prices and we will try our best to make the delivery of products on time as well as possible. So give us a chance to serve you. If you required any samples so please don’t feel hesitation to ask from us for your approval and comments. For the better running of business relationships it is very essential for both the parties to cooperate with each other. The cooperation between both the parties is very meaningful to give progress the business relations. Kindly See Attachments of Catalog. Note: Delivery of instruments will be according to customer requirement & Shipping charges will be calculate on total weight of parcels. Thanks for your very helpful post. I would like to ask if you saw many partywear fabrics such as sequins, velour, glitter fabrics in this market? I just don’t want to go all the way there is there is not much of this kind of fabric as this is all I want. I go there often. If I can help some people purchase let me know. The general purpose of wearing an easygoing shirt is remaining agreeable. Thus, the texture of your shirt is similarly as imperative as the fit. You ought to go for a fabric that is light and breathable. And in China market provide the cheap fabric.